The many factors behind Donald Trump's surge to the top of Republican polls are hardly new. There is broad dissatisfaction and distrust of “professional politicians” and with what is widely perceived to be an incompetent Washington that is in the pocket of wealthy and narrow-minded corporate interests. Individually, there is economic insecurity, and collectively a sense that the nation no longer commands the respect, admiration, and fear on the global stage that it once did. In short, there is a gnawing and gloomy perception that America has lost its way. There is certainly some truth to all of this. Trump thinks he is the answer to these problems -- just ask him -- and with a pithy slogan that can be sewn (presumably by American labor) onto the brim of a hat. “Make America Great Again” indeed sounds quite Reaganesque. In our current, toxic political ecosystem his outsider status (as much as any Manhattan billionaire can be considered an outsider) and the fact that he is a can-do businessman are attractive qualities to many. But they are hardly new, either. History tells us that business success does not necessarily correlate with success in the White House. In fact, and perhaps surprisingly, the opposite appears to be true. Of the 43 men who have been president (Grover Cleveland is counted twice, of course), many got their start in the business world, yet historians rank just one of them -- Harry Truman -- well. Notes: The Siena College Research Institute (SRI) has been conducting the US Presidents Study since 1982. 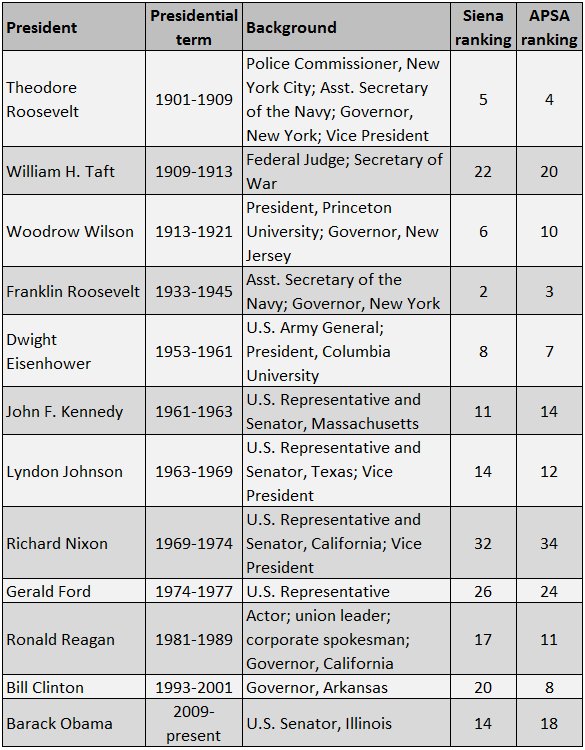 The study calls upon historians, political scientists, and presidential scholars to rate the presidents in twenty areas. See more here 1. The American Political Science Association: 391 members of the American Political Science Association's Presidents & Executive Politics section 2, the premier organization of experts of the American presidency, were invited to complete the online survey, which was administered by Brandon Rottinghaus 3 of the University of Houston and Justin S. Vaughn 4 of Boise State University. 162 surveys were completed online between May and November 2014. For more information, please contact the authors. 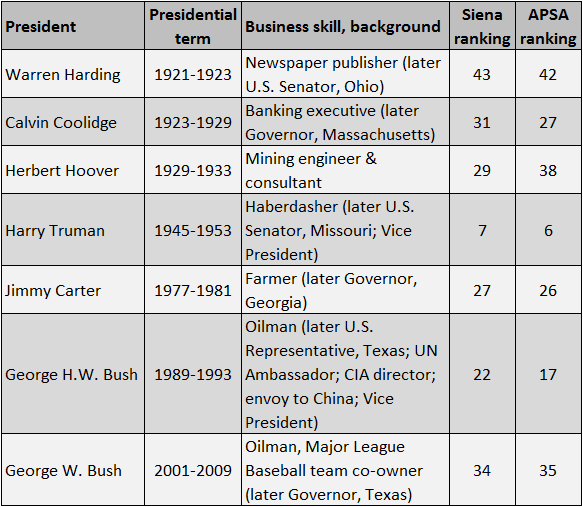 Taking the Siena and APSA data together, the average ranking is 27 and median is 28, putting the group near the bottom third of all presidents. Were it not for the only businessman-turned-president who cracks the top 10 -- Harry Truman -- the results would of course be even poorer. And ironically Truman was a failure as a businessman: the clothing store he co-owned in Kansas City lasted two years before going bankrupt in 1921 (upside: he would later become the sharpest presidential dresser, owning a reported 486 ties). Now let's look now at the presidents of the modern era who lacked business backgrounds. How do they rate? While just one in seven of the businessman-turned president appears in either the Siena or APSA top 10 rankings, five of the 12 non-businessmen do. Of these, two -- Theodore and Franklin Roosevelt -- are in the top five, indicating true presidential greatness. When it comes to Donald Trump, we can debate all this 'til we're blue in the face (haven't we already?). There can be no question that his combination of brash confidence, aggressiveness, and spirit has struck a nerve with at least a portion of the electorate. But current popularity aside, effectiveness and ultimate greatness in the White House is based on numerous variables that blend together over many years and through gradually evolving economic, socio- and geopolitical circumstances and cycles. Skills other than being a sharp-elbowed businessman come into play: the ability to empathize (Lyndon Johnson and Bill Clinton), and persuade with eloquence (FDR, John F. Kennedy and Ronald Reagan), for instance. Truman himself said it best: “All the president is, is a glorified public relations man who spends his time flattering, kissing, and kicking people to get them to do what they are supposed to do anyway.” Trump does not, it seems, have LBJ's empathy or the inspirational eloquence of Reagan. That he appears to lack these skills should not be discounted. Indeed, while Trump's steamrolling, belittling tactics play well on the campaign trail, it's questionable whether they would translate into effective governance. They are tactics that very well could backfire with a Congress that would not be at all beholden to him, and with a federal bureaucracy over which presidents have little control (Trump perhaps doesn't understand that unlike a CEO, presidents have hiring and firing power over only a tiny sliver of the government). History does not suggest that a Trump presidency, in the very unlikely event that it came to that, would be overly successful. Paul Brandus is the founder of the White House-based news service West Wing Reports and author of the upcoming book Under This Roof, a history of the White House and presidency. You can follow Paul on Twitter @WestWingReport 5.